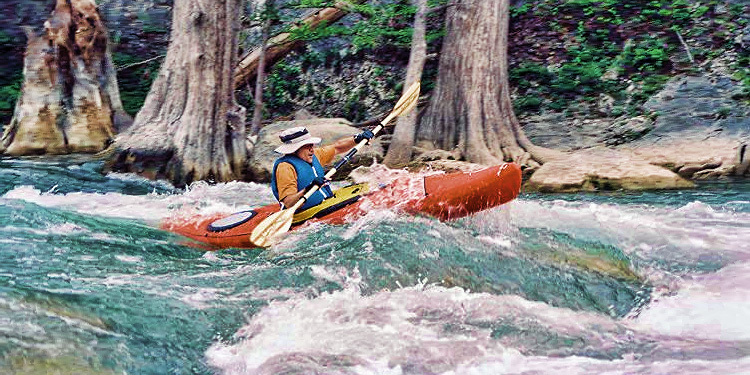 There’s more than one way to enjoy the beautiful scenery along the Guadalupe River. Paddle along a 9.9-mile stretch of the Upper Guadalupe, gliding past by an abundance of mature trees and a spectacular mix of limestone cliffs and shelves along Nichol’s Landing Paddling Trail. Paddlers will enjoy an exciting three- to six-hour ride on a variety of rapids between gentle stretches. The Guadalupe River’s famous for its high limestone bluffs; rugged shelves and boulders; giant bald cypress, pecan, cottonwood, oak, elm and palmetto trees; and a wide variety of shrubs and vines lining the river. The Guadalupe provides diverse habitat for deer, armadillos, raccoons, foxes and squirrels. River beavers also have been sighted — as well as livestock watering in the river. The put-in for this paddling trail is located on Old Spring Branch Road, just three miles west of Hwy 281 N, off Spring Branch Road. Take-out at the FM 311 crossing some two miles southeast of Spring Branch. The last public-access site above Canyon Reservoir is at Rebecca Creek. To get there, travel approximately three miles east on Rebecca Creek Road off of Hwy 281. An alternate take-out is located at FM 311 some 5.4 miles from Nichol’s Landing. Click here for more information from Texas Parks and Wildlife. Parking for shuttle vehicles at FM 311 and Rebecca Creek crossing water access points if free, but be prepared to walk uphill to the parking area. Shuttles and rentals include Bigfoot Canoes, Guadalupe Canoe and Camping, Guadalupe Canoe Livery, Guadalupe River RV Park Campgrounds & Nature Trails, Austin Canoe and Kayark and REI. Access to Nichol’s Landing site is free except on weekends and major holidays from Memorial Day through Labor Day. On these dates, parking and access is $3 for Comal County residents and $5/car for others. Fees are used to maintain access points. A number of rapids on the 10-mile stretch demand careful inspection. Approximately 1.5 miles below FM 311, crossing a chute to the left of the island at Mueller Falls creates a fast-water run. About five miles below FM 311, a chute to the left of Rust Falls provides another exciting passageway. Hazardous areas can be portaged. Except for extreme droughts, there is always sufficient water for recreational use along this Hill Country River. The Guadalupe is known for its clear-flowing waters and scenic beauty. Paddlers are minded to avoid trespassing or littering. The Guadalupe is classified as navigable, which permits public use of streambeds and, if necessary the banks to portage hazards. Any other use is considered trespassing. This section of the river supports largemouth and smallmouth bass, gar, crappie, carp, stripers and a variety of sunfish and catfish. Small lures such as jigs, plastic worms, spinner baits and light line are recommended. This is a good article, but you really should not have used a picture of a kayaker going over a rapid who is not wearing a helmet. If that person were to have fallen out, he could have been in big trouble.